As an elite roofing contractor and experienced home improvement specialist here in Austin Texas, Dustin Johnson Exteriors & Roofing aims to provide the best quality service including our window installation and replacement services. In order to help us deliver such promise of high-quality window service, we are proud to communicate that we have gained partnership with Pella Windows & Doors, an esteemed manufacturing company that has over 85 years of experience in the home improvement and renovation industry. Here Dustin Johnson Exteriors & Roofing, we are committed to providing homeowners and business owners the superior windows and window replacement service there is in Travis County, TX. We have dedicated installers, artisans, and project managers to assist you with your window needs, starting from the estimate, on-site project management, and after project customer service. We will deliver the best home improvement service in the form of a reliable and high-quality window installation or replacement. At Dustin Johnson Exteriors & Roofing, we provide made to order Pella products; our delivery truck will arrive on time to avoid delay of your construction or home improvement project. 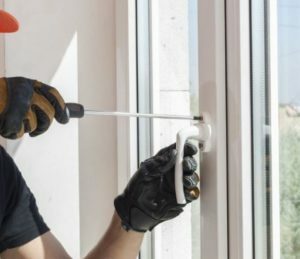 Our window products are well-packaged for protection and easy handling, allowing seamless installation. With our partnership with Pella, you are given an opportunity to choose from a wide range of impeccably crafted products that will surely meet or even exceed your requirement. Apart from the craftsmanship and exquisite design of our window replacement, we also make use of Pella products because of the efficiency it offers. No matter where you live here in Texas, we offer the right window option for you that can definitely provide efficiency and cost-effectivity. With Pella’s InsulShield glass collection– Advanced Low-E Insulating Glass with Argon7; SunDefense Low-E Insulating Glass with Argon7; NaturalSun Low-E Insulating Glass with Argon7, you are given the most innovative energy-saving choices, constructed for particular climate types, especially with the humid & arid climate of Texas. With the various options available and the extensive training and experience of our window specialist, we can assure you of the most practical, aesthetically pleasing, fitting windows delivered and installed to your home. Our partnership and utilization of Pella products have improved our capacity to deliver the best windows service you deserve. Regardless of the demand and your preference, we will see to it that we can address any of your home improvement needs, especially concerning your windows. Since we are fully aware of the potential expenses ahead, we offer a free estimate to any of your windows related project, be it installation, window replacement, or window repair. Together with Pella, Dustin Johnson Exteriors & Roofing assures you of a innovation with purpose while going beyond requirements and exceeding your expectations. Check What They Are Saying Our About Our Services! To know more of our windows services and other home improvements services such as siding, gutters, and roofing, you may contact us at (512) 337-2661 or visit our office centrally located at 901 S MoPac, Expy building 1, #300 Austin, TX 78746 for a personal consultation and free estimate. Contact Us Today.